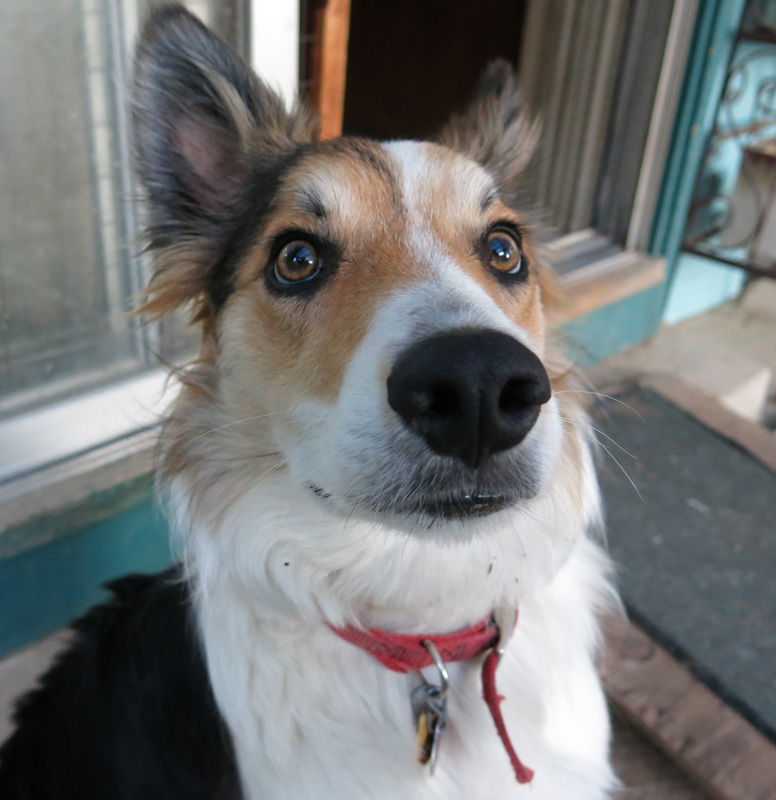 Greetings and salutations, everyone; yes, once again it is I, Mani the pretty normal-sized purebred border collie, filling in for the guy I live with, and here to bring you the latest news from our garden. You may remember me from such posts as “Mostly Iceless”, among so many, many others. Here I am in a characteristic pose. Well, sort of characteristic. There were a couple of anniversaries a few days ago, and the guy I live with talked about them constantly. I was interested, for a while. The last day of May marked the last day the guy I live with worked, and the first of June marked nine years since he’s been retired. He talked a lot about how the nine years were not at all what he expected them to be, and how he never expected things to be the way they are now, and that there were lessons to be learned from all of this, but I kind of stopped listening. So most of the last several days has been filled with me doing things, with a bunch of talking in the background. Something useful actually did happen today, when this was brought home. This is a flat of pots of Dog Tuff grass, which is going to be planted in the “way back”, and is supposed to be tough enough for me to run back and forth on it a lot, and it still grows. The buffalo grass didn’t really do that, but then, it was put in when Chess was here, and Chess wasn’t much of a leaper and racer, unlike me. 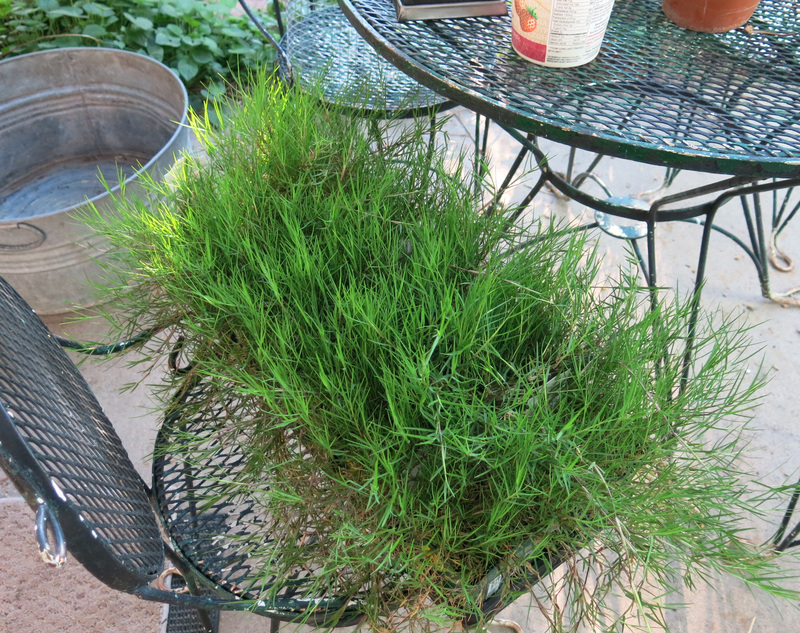 And, yes, it’s Bermuda grass, though I think it comes from South Africa, which is pretty weird. I mean it doesn’t come directly from South Africa, it was grown here. You know what I mean, I hope. The guy I live with said it was “kind of green”, but I guess we can live with that. Well, so, while all the talking was going on in the last several days, and looking at the grass right there, it might be a good idea to reveal the “super genius” idea that the guy I live with came up with. He hasn’t trademarked it or anything like that. What he said was, oh, you might look at a couple of garden pictures first to get ready for it…(these are huge files which you can embiggen if you want). If you did embiggen the pictures, you may notice that there are an awful lot of weeds in the pictures. Especially grass. The smooth brome that the guy I live with talks about all the time. He said (get this) that he might write a gardening book in which weeds are simply considered part of the garden. He hasn’t come up with a fancy term for this style of gardening, but he says it’ll probably catch on quickly. This is, after all, the weediest year he’s ever seen. I looked more than a little dubious when he suggested that I mention this in the post. (The “super genius” bit was very hard to swallow, too.) This is me looking dubious. So that’s the new plan. 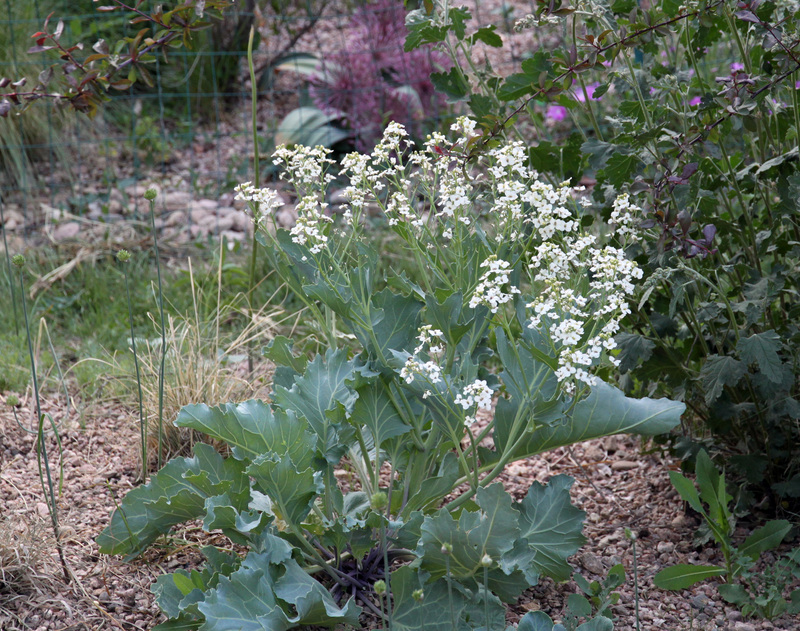 I almost forgot to show the sea kale (Crambe maritima). It’s flowering now. I guess the reason I’m supposed to show this is that there are two plants here, and both got eaten last winter. Right down to the ground. It turns out that the guy I live with and I totally disagree on the edibility of kale. (It was pretty good.) You can see a weed there, too. See, the plan is already in place. I guess that’s it. I feel kind of weird telling you what the guy I live with says is a “super genius idea”, but I did anyway. We’ll see how successful this turns out to be. Thanks; well, the guy I live with has an awful lot to say about smooth brome, but that it can’t be printed in a blog of such gentility as this one. I did help a little, eating as much grass as I could, while it was being dug up, and cursed at, and stuff. 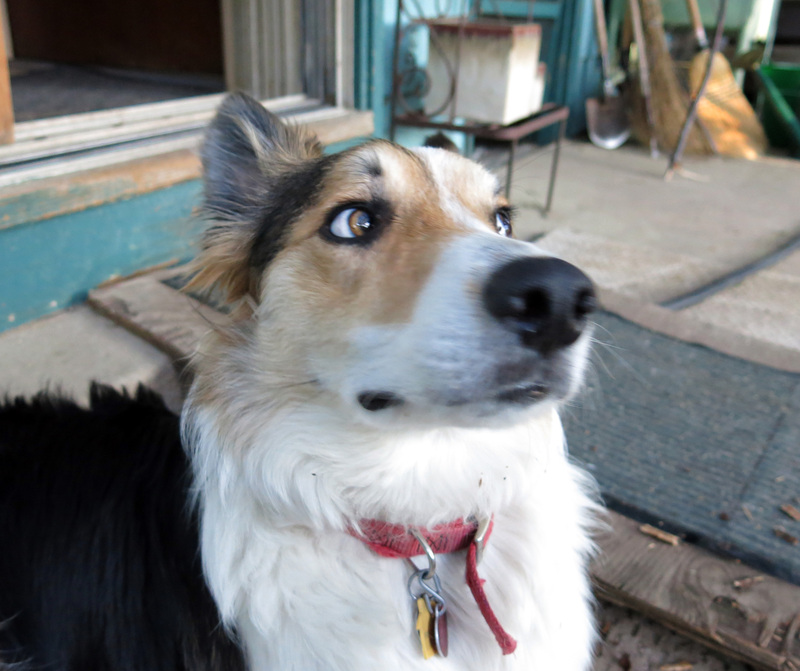 But a purebred border collie can hardly live on eating grass. No, there isn’t any Mexican primrose here. Plants were planted in the past, but none ever made it to live another year. Not enough water. The sea kale is supposed to get much huger, and if you want to look at how great it can be, take a look at the pictures of the late Derek Jarman’s garden, here: https://www.flickr.com/photos/angusf/sets/656542/ The garden was occasionally, or periodically, destroyed by the sea, which is, according to the guy I live with, a metaphor. Thanks for the Jarman site. 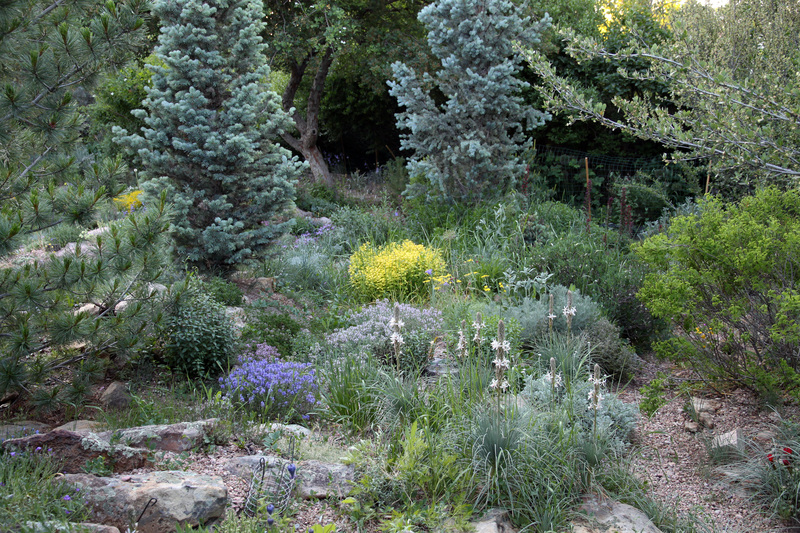 I’ve seen the garden in books and magazines, but this site is a neat compendium. I can definitely go for some huger sea kale. 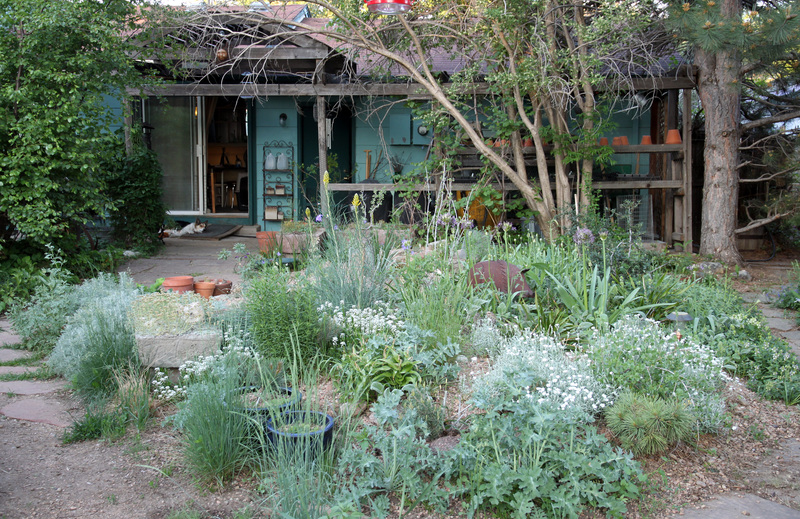 I am all for including weeds as part of the garden. If that’s the case, I’m way ahead of the game. Cheers. Well, the guy I live with says that so long as you give him a zillion dollars every time you let a weed grow in your garden, and think that that’s okay, then we have no problem. He also says to say “lol”, which I guess is something important. When I saw the title, I thought you were the super genius Mani. You look even more intelligent than usual in that first photo. How about “Cultivating Weeds” for the book title? Thanks, well, of course I am the real super genius here, but the guy I live with was all proud of himself for coming up with such a brilliant idea. But the title needs to be more philosophical, like “Just let everything grow”, or something equally pretentious. paul simon says “one man’s ceiling is another man’s floor” ~ so, perhaps one person’s weeds are another person’s flowers. i can relate to that! 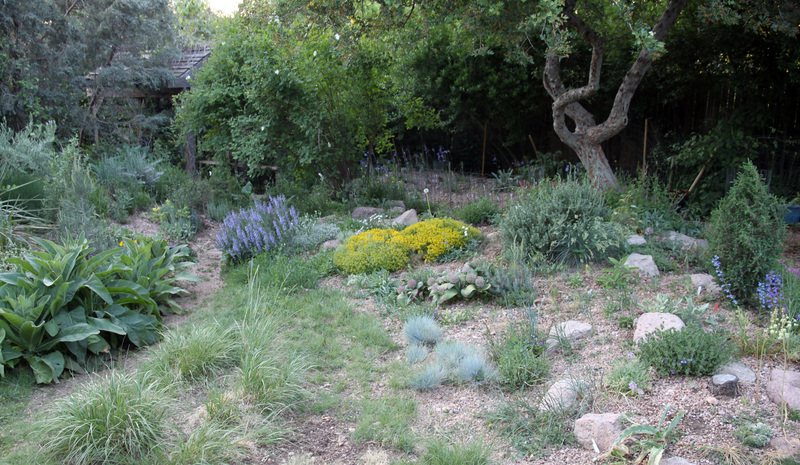 i have learned “selective” weeding with the large plot i’m in charge of, and it’s helped me relax more about what needs doing in the garden. by the way, mani, you have a most effective (and adorable) dubious look! Thanks; I guess I’d have to agree that I’m adorable. I don’t really know what all the furor is about weeds, since everything looks the same to me. Just a bunch of plants. Some get fussed over, and some get yanked out. I think Bermuda grass is evilest of grasses. It is my nemesis. Dogs won’t kill it. Nothing does, which I consider a problem when it gets into flower beds. I’m thinking maybe this idea cancels out the super genius idea: normalcy restored. The guy I live with says that nothing is worse than smooth brome. Absolutely nothing. The Dog Tuff grass can duke it out with the smooth brome. Try “Grass-B-Gone”. Even works on Bermuda grass. Has not hurnt anything else in my garden. 🙂 I must remember that word! 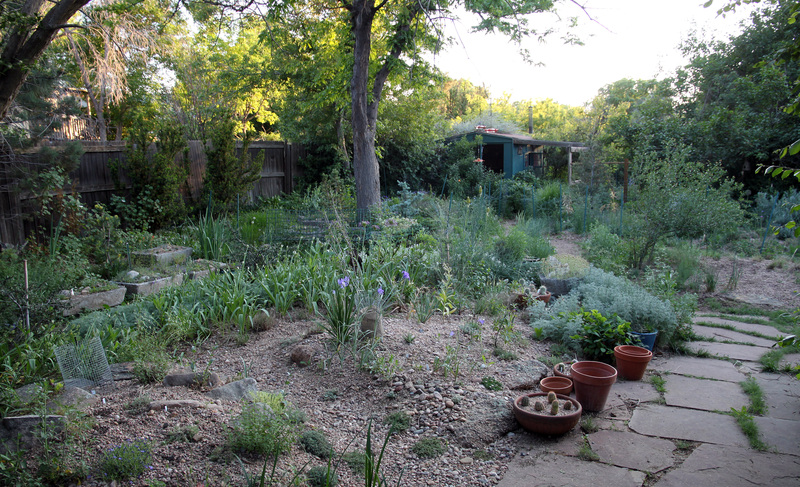 The garden looks ab fab, especially when the pics are embiggened.